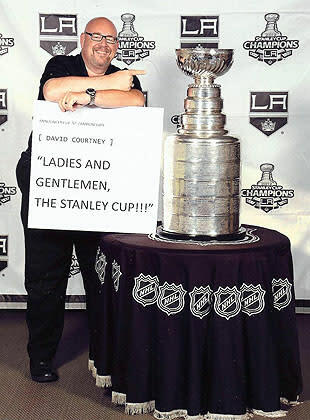 Sad news for Los Angeles Kings fans and the LA sports fan community: The Kings reported on Thursday that David Courtney, the team's public address announcer for the 22 seasons, has died at age 54. Courtney also served as the PA voice of Major League Baseball's Angels for 18 years and was in his third season with the Los Angeles Clippers. No cause of death has been released, although Courtney tweeted on Wednesday that he was "in the hospital waiting for an angiogram." "David was tremendously passionate about the Kings, our fans and the game of hockey. His time with the Kings dates back to the mid 1970s both in our PR office as our public relations director and also with work he did in our video department before he took over full-time Public Announcing duties at the Forum and STAPLES Center. In the arena he was an institution — he was the voice of the Kings — and his work added so much to the live, in-game experience for our fans as it did for the Clippers and Angels as well. Next season would have been David' 35th year with our franchise, and on behalf of the entire Kings organization and AEG we are incredibly saddened by this news and we send our deepest condolences to his wife Janet and the rest of the Courtney family." The Angels family is deeply saddened to hear of David's passing. He was a gentle soul, a consummate professional and an unforgettable voice tied to several professional Southern California sports teams. Over the past 18 years, his love, dedication and passion for the Angels was evident every time his voice rang through the ballpark. Our thoughts and prayers go out to David's family at this difficult time." His path to becoming the voice of the Kings had a storybook quality. He saw his first Kings game in 1968 on a school recreational group outing and fell in love with the sport and the Kings. At first, he wanted to be "one of the guys in the cool NHL blazers (off-ice officials)," and wrote then-NHL President Clarence S. Campbell to offer his services. Mr. Campbell's office encouraged him to follow a path through the team and in 1971, at age 14, he was given a job as a "go-fer" in the Kings' Public Relations Department. Over the next seven years, he did just about everything but coach or play for the Kings: assisting in the press box, working the locker room and filling-in as a stick boy, running the scoreboard, writing press releases and coordinating player appearances, ticketing operations and even learned how to drive the Zamboni. He left the organization in 1978, only to return in 1985 at the urging of his "friend and mentor" Bob Miller, the play by play voice of the team. Beginning in the 1989-90 season, Courtney was the in-arena voice announcing lineups, goal scorers and, of course, adding to the soundtrack of a Stanley Cup championship in 2012. And here are his intros for the Clippers. Here's more from John Hoven of Mayor's Manor. Condolences to Courtney's wife, Janet Fisher-Courtney, and his family.